Intercultural community awareness sessions promoting cultural understanding, harmony, cooperation and tolerance have been a regular event in the settlement program’s support of new arrivals. 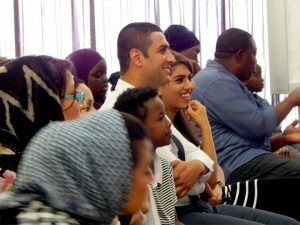 A new direction was the delivery of a successful Multi faith session that promoted and encouraged interreligious and intercultural dialogue; highlighting a culture of peace and non violence and raising participant’s awareness of intolerance and discrimination based on religious beliefs. The various guest speakers represented a range of religions and faith groups in our society and their presentations provided positive information that focused on building bridges of understanding between religious groups which in turn builds a spirit of understanding and social cohesion in the community.